Just like boxing, writers fall into different categories based on their techniques and skills. 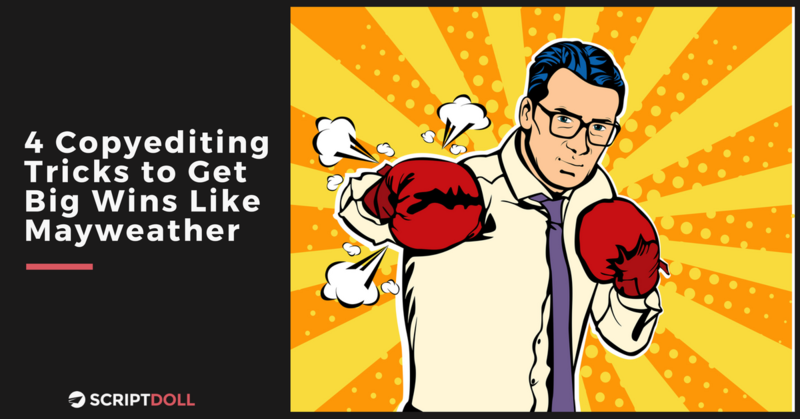 But, no matter what kind of competition you’re up against, you can grow into a true contender with your sales copy if you simply make time for editing. After all, when you sit down to write your content, it’s not going to be a champion piece right from the start. Nope. Instead, it’s crucial you keep coming back to it after the first draft to correct any and all errors—from spelling to grammar, continuity, flow, punctuation, and so much more. Yet, as an entrepreneur, chances are it’s not in your blood to know all the ins and outs of copyediting. You’ve got bigger things on your priority list, like running a successful business. Therefore, I’m here today today to help you quickly become the one and only Floyd Mayweather of sales copyediting. Yep, you read that right—all by giving you just four tricks you need to revise your content so it packs a serious punch and gets you big wins with your audience. Okay, that might be music to your ears and all. But, maybe you feel as if it takes you forever and a day to even craft copy that’s worthy of putting in front of your fans. And, you’re ready to throw in the towel. Well, if that’s the case, you’ve been saved by the bell. Stick with me until the very end of this post and I’ll share a one-of-a-kind tool with you that’ll knock out the task of writing for you. For good. You won’t want to miss it! Let’s end the copywriting madness once and for all, and get active instead of passive. Yes, I’m taking you back to those glorious English class days. First thing’s first, what’s the difference between active voice and passive voice, again? Active voice describes a sentence where the subject performs the action stated by the verb. Passive voice, on the other hand, describes a sentence where the subject is acted upon by the verb. Okay, but why does passive voice get such a bad rap? Well, George Orwell is partially to blame. In his 1946 essay on language and writing, he demanded active voice be adopted whenever and wherever possible. Thus, most followed his lead. Now, let’s take a look at active and passive voice in action to see exactly why Mr. Orwell felt that way. Sentence #1: A great time was had during the boxing match. Sentence #2: We had a great time at the boxing match. A “by” phrase that makes sense. If you can add one to the end of a sentence and it is easy to understand, chances are, you have passive voice. So, let’s use “by the dog” as our “by” phrase. The house was destroyed (by the dog). The dog destroyed the house. See how easy that is? So, I’m encouraging you to get active as often as you can to keep your reader, well… reading. You know all those inflated words and phrases many entrepreneurs like to use in their content to really show off the fact they’re intelligent? Don’t be like them. Doing so will only make your readers go down for the count—putting them into a sleepy state of mind as they scroll as fast as they can to get through all that boring, jargon-filled nonsense. Annoying, right? So, if you catch any phrases like those listed above while you’re proofreading your copy, go ahead and replace it with a word that makes sense to your readers. Speak their language. And, if you’re feeling lost when it comes to tackling this trick, all you need to do is flip through your reviews, emails, and other customer interactions to get a feel for the exact lingo to use that’ll resonate the most with them. 3. Keep it real with your fans. What I mean by that is, write like you speak—in real life. I like to use the coffee with your customer analogy. Write to your reader like you’d speak to them over a cup of Joe at the local coffee shop. And, this one’s a fun one: read your rough draft out loud. When you do, it’ll be easier for you to notice the littlest mishaps, awkward words, and ill-formed sentences to nix ASAP. Consider how quick a professional boxing round is—just 3 minutes. That’s it. Any longer, and the boxers wouldn’t be able to keep going for a maximum of twelve rounds. Therefore, think of your content in the same way. The last thing you want to do is get long-winded and put your reader into a content coma, making their eyes barely stay attached to the screen as they drift away into another thought. Yikes. Wondering how to avoid doing that at all costs during the copyediting process? Sure you are. Transform sentences into short punches. Run-on sentences are easy to come by because you just have so much to say. I get it. But, they’ll make your reader punch drunk. Seriously. Thus, cultivate the style of writing short, punchy sentences that balance out your longer lines of words to keep attention levels high. Go bold. Italic. And any other formatting techniques you can think of—bulleted, underlined, subheads to separate ideas; the list goes on. Doing so will make it easier for your reader to scan the page and gather the necessary information they need. Remove lazy throwaway words. Such as “that,” “stuff,” “things,” “often,” “very,” and “really.” If a sentence still makes sense without any of those, do yourself a favor and throw the word away. This isn’t about achieving a word count goal. It’s about doing what you can to make your content stronger. Just be sure that while you work on mastering the art of brevity, you’re also mastering the art of clarity. After all, easily digestible content + easily understandable content = champion content. But, is the main event—actually writing your sales content—taking up too much of your time, making you want to throw in the towel? I’m with you. I was once in your shoes. That was, until I found the key to alleviating my biggest headaches. Meet your new copywriting companion: ScriptDoll. It’s a sales copy engine dedicated to assisting you with composing persuasive sales content in minutes. Once you create your product portfolio and answer a handful of painless questions, ScriptDoll drops those answers into thoughtfully crafted content scripts that sell—sales letters, email sequences, you name it. Frees up your time to put focus towards more productive tasks—simply complete your product portfolio, answer various questions regarding your product details, bonuses, and more, and ScriptDoll turns your answers into engaging copy in a matter of minutes. Saves you some serious moola by keeping your copywriting in-house—there’s no need to drop loads of money on outsourcing your writing tasks to copywriters. And, you can also avoid investing hours of your time trying to improve your skills in a copywriting course. That’s because ScriptDoll crafts its effective templates thanks to its connections with champion copywriters around the world! Decreases your workload to almost nothing with pre-made product profiles—are you a puppy trainer, dentist, plastic surgeon or graphic designer? If so, you’re in luck because your product profile has already been completed for you. There are many more waiting to be used within the software engine, making it that much easier to push out content that converts. Grab hold of champion content to knock out your readers today! As Copyblogger states, “Adaptation is essential to effective communication.” No doubt about it, the four copyediting tricks we shared with you today will help turn your content into champion pieces that knock out your readers in no time. Not to mention, we let you in on a tool that’ll help you take back your time to focus on the things you do best. Still on the ropes about it? Entrepreneurs like you are raving about ScriptDoll—relieving them from the struggles of writer’s block to create alluring content with little to no effort. We hope you’ll join them and look forward to you getting the results you’ve been searching for. They’re ready and waiting for you. Have questions on copyediting? We’ve got answers. Just drop us a line in the comments section below—we’d love to hear from you. Who Is Your Perfect Customer? The Ultimate Guide You Need to Catch Them Today.